...I was wondering if you could help me in a really big way. One of our employees past away this last December and he was a very close friend of mine. The week before he passed he handed me a stack of Warmachine miniatures, he and I were going to paint them and work on them together, that would be the last time I saw him. That bag of stuff has been sitting in my station at work for the past 6 months just eating at me. What else is there to say to a request like this? I know Matt and he's gone out of his way on a number of occasions to help me both as a friend and an employee of Game Vault. He's always been willing to get me whatever I needed even if it meant giving something of his when the store was out. I think my reply was two sentences and consisted of something like "Don't think twice about it" and "When can I come get the model from you?" And that brings me to where I am now. 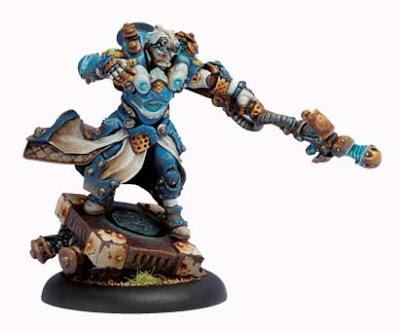 I have this killer looking Warmachine model to paint. Apparently he's some HQ type model and is quite powerful. This is what I get after looking through the book about him. His name is Nemo. Actually it's General Adept Nemo to be exact. Since I have no idea how to paint this guy, I went looking and found this image. Quite the interesting looking fellow if I do say so. Very old and lots of lightning effects all over him. This guy is going to be a real challenge to do well. It's definitely going to put my OSL skills to use. I'll get to do some weathering along the bottom and I told Matt I'd sculpt some paving stones on the base to mimic what he was doing with the rest of the army as well. My hope is to get him to match the color scheme in the picture. I suspect I can get him close and hopefully it will work out well enough for the army. You can see the follow-up WIP post here. I've yet to get any WarMachine minis myself, but the range is really nice and a few of my friends have some very nicely painted figs. Looking forward to seeing what you do as I'm sure it will be an inspiration. I am definitely looking forward to seeing your Nemo! I am sure your OSL will be awesome. Also, Nemo is indeed Lightning focused but he first is a warcaster; you may find inspiration on Andreauderzo deviantart account (official artworks). A tragic story but a great cause! Good luck Ron, I have some Cygnar but I didn't really know what I was doing when I painted them and I still don't have much of an idea what it's about. Great stuff though, I'm looking to see how it turns out. General Adept Nemo is what is called a Warcaster. These are magicians that have the ability to control the giant robots called warjacks. 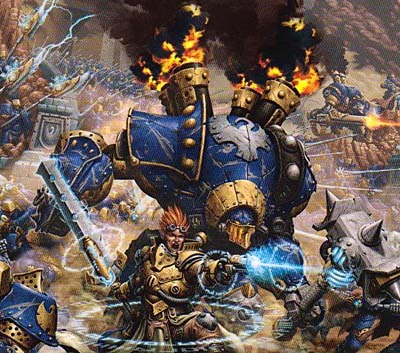 In addition, the country he is from, Cygnar, is famous for their lightning weapons, many of which he helped create. So in short if you took Einstein's mannerisms with Tesla's work with electricity and shoved it into a magician who controls giant semi-sentient robots, you have a close approximation of the character. Only 35. Wow. I turn 35 this year. Makes you think. Sendraks: There's lots of detail on this guy (especially for his size). Way more than I'm used to painting. Anon: I don't know about that, I'm hoping I can get most of it similar enough that Cygnar players recognize the effect I'm trying to accomplish. If they're anything like Blood Angel players, they're a tough lot to convince. wookieegunner: It was interesting to read the "codex" for the army. This guy seems like one of the old ones that has more knowledge than all of the young kids on the block put together. As far as the scheme on this guy, you can't go wrong with black/white and any one other color on a model. I tried to make him a little more battle worn like the art I found, so we'll see how he turns out. They are nice models to paint on, very slick and clean. A lot of detail overall and a bit of surface area to do some freehand if you wish. I do suggest pinning the models even if they are plastic (they are heavy!) but they are solid parts. Ron - my view is that more detail makes things easier rather than harder. Detail does a lot of the work for you in making a model look interesting, where as less detailed models the painter has to work harder to bring them to life. Fayte: That's my plan too, but I think i'm going to start lighter than Regal Blue with this guy. Sendraks: I agree 100 percent. I think the super complex/detailed models are a piece of cake to paint. Like painting by numbers. They just take so much longer than models without all the detail on them. Marshal: While I didn't know the guy personally, I know Matt and that's more than enough for me to want to kick in a bit and help out. I just hope the end result is something Matt can be proud of having in the army.